Photo courtesy Livingston Daily Press & Argus. Concerts at the Courthouse in downtown Howell begin at 7 p.m. Friday, July 10, with the toe tapping swing sounds of the Rhythm Society Orchestra! This 15-piece ensemble became the winner of the BIG THREE Battle of the Bands in 2005, 2006, 2007, 2010, 2011, 2012 and 2015! 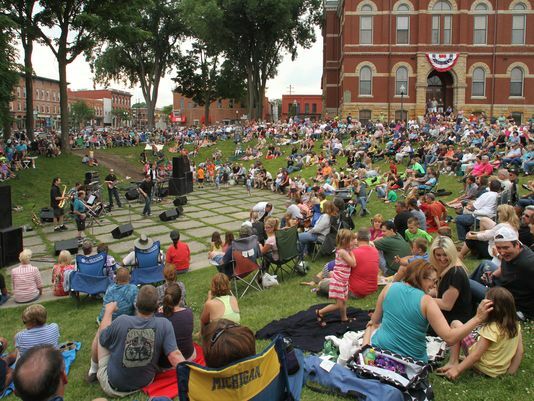 Concerts at the Courthouse is a free, family-oriented, pet-friendly outdoor musical series located on the courthouse lawn in downtown Howell featuring a variety of music styles every Friday night through Aug. 28. The summer series is hosted by the Livingston Arts Council and the Howell Opera House. Sustaining Sponsor: Robert W. and Maxine C. Parker Foundation. Supporting Sponsors: Scully Monroe Insurance Agency, Heart of Michigan, Howell Family Dentist and the Downtown Development Authority.